With the Sedona food dehydrator by Tribest, you can accurately and efficiently dehydrate your favorite food and vegetables utilizing the latest in digital dehydration technology. From, apples to bananas, to mushrooms and your favorite dehydrated treats, you can set Sedona to meet all your dehydrating needs. Sedona is the advanced solution to dehydration - offering you all the options you require to make the dehydration process as simple and as convenient as possible. With Sedona, you can set the timer up to 99 hours or to continuous mode for up to 150 hours of worry-free uninterrupted operation. Because Sedona utilizes two independent heating mechanisms, the distribution of heated air is evenly circulated dehydrating your foods evenly. Sedona offers you the ability to dehydrate a little or dehydrate a lot. Dehydrate up to 9 trays of fruits and vegetables or divide the machine into two 4-tray chambers for smaller batches of your favorite dehydrated recipes. Sedonas two fans can easily be adjusted to reduce the fan speed for quiet operation, offering you a convenient way to continually dehydrate during the evening hours without the added noise and distraction. Sedona also offers you a convenient way to monitor your foods with a see through a tempered glass window at the front of the unit. With the Sedona dehydrator, you can be confident that the temperature you set on the digital control panel is the temperature that is maintained inside the dehydrator because it microprocessor controlled. 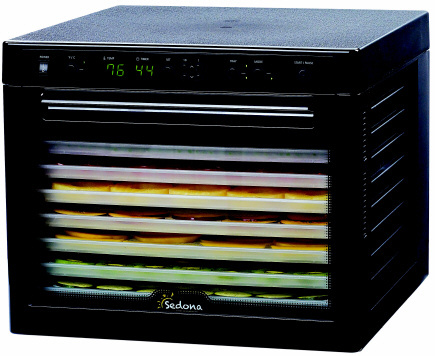 The Sedona Food Dehydrator is engineered to last. 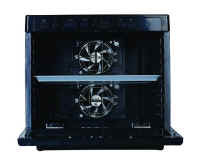 The 5 year warranty is your commitment to you that your dehydrator will provide years of trouble-free operation. Tribest have been offering small appliances for healthy lifestyles for over 20 years. The Sedona dehydrator is their latest product that allows you to lead a healthier lifestyle. Included with the dehydrator are over a half-dozen raw dehydrator recipes so you can enjoy recipes like: Sprouted Grain Tortilla, Basic Squash Flax Tortilla, Garden Crackers, Easy Flax Crackers, Marinated Vegetables, Sweet Sedona Cookies and Easy Fudge Brownies. The control panel on the dehydrator allows you to see the temperature inside the unit as well as the digital countdown timer. POWER Switch - turn the unit off an on. TEMP window - displays the actual temperature inside the dehydrator or will show you the temperature you set. TIMER window - Shows the number of hours left on the count-down timer or will show you the hours you set on the timer. SET button - Enables you to set the temperature or time. START/PAUSE button - Used to start or pause operation. Please note: We recommend this dehydrator for people who want to dehydrate fruits, vegetables, nuts and seeds. 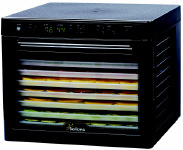 We do not recommend this dehydrator for people that want to dehydrate meats for jerky. This machine does much better on "the lower end" while the excalibur is better for "upper" end temperatures.